How to apply nailpolish? Sure, almost everyone knows how to apply nailpolish. But when you apply nailpolish, if it’s on your toenails or fingernails, you want it to last longer than just one day. Today we share some tips how to apply nailpolish, so that it lasts at least for a whole week. For these tips we went to several professionals concering nailpolish and manicure, like beauticians. Before you start to apply nailpolish, you should first ‘prepare’ your nails. If your nails are too long, trim them to the length you want. After trimming your nails, you should smooth out the edges by using a nail file. Create the desired shape of your nails with the nail file. Make sure you move the nail file in one direction, or else you will create jagged edges which will lead to breaking and splitting of your nails. Some nail salons will cut your cuticles because they think that creates a nicer appearance on your nails. We’ve got news for you, you shouldn’t cut your cuticles! Your cuticles are there to provide a kind of protective barrier on your nails. So don’t cut your cuticles, but use some cuticle oil instead. If necessary, push your cuticles back with your fingernails or a cuticle pusher. Now your nails are ready for the first nailpolish: a basecoat. A basecoat will ensure your nailpolish will last longer and clings better to your nails. And – probably even more imporant – it prevents your nails will discolour from dark nailpolish. The basecoat we would recommend is the Start-to-Finish formula from OPI, which is a basecoat, top coat and natural nail strenghtener. Before you apply a basecoat, make sure your nails are clean and free of any dirt or old nailpolish that will cause a new nailpolish to chip easier. After all, a new nailpolish won’t be able to cling to your nails when their not clean. Therefore, never apply new nailpolish on your old nailpolish! Let your basecoat dry for a few minutes. One of the most important things is that you choose for a good quality nailpolish. It may be more expensive, but in the end it will be cheaper. A good quality nailpolish will last longer and you don’t need to re-apply your nailpolish that often. The nailpolish brands we love are OPI, Koh and Essie. OPI is definitely our favorite, because the nailpolish from OPI really lasts for at least a week. On our toenails it even lasts for two weeks! Now apply the first layer of nailpolish. Dip your nailbrush in the polish, just so you’ll have enough to apply a thin layer of nailpolish. After you finished both hands, start applying a second layer of nailpolish on the first nail you’ve applied nailpolish. Apply a second layer on all your nails. 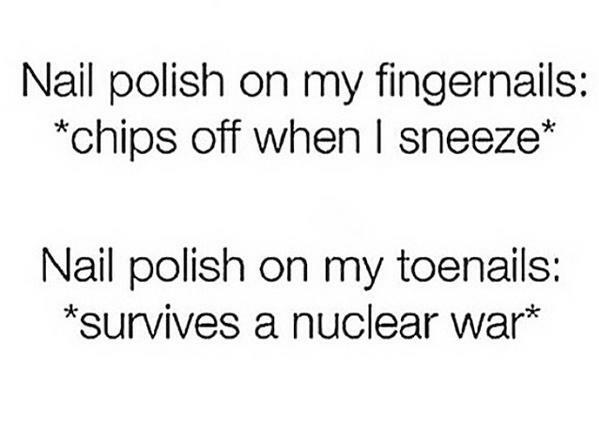 Let your nailpolish dry. Once your nails are dry, you’ll need to apply a top coat to ensure your nailpolish will last longer. A topcoat also provides a nice gloss on your nails. We’ve experienced the best time to apply a topcoat is the day after. Than you will know for sure that your nails are dry, so your nailpolish will cling better to your nails. If you accidentally applied nailpolish on your fingers instead of your nails, remove the nailpolish with a cotton swab dipped in nailpolish remover.